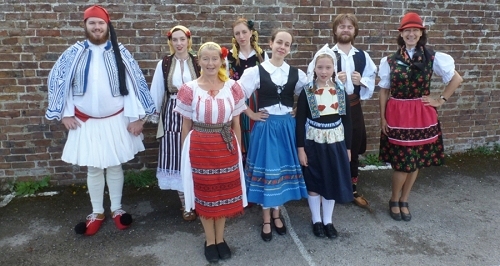 The display team is made up of interested adults and children from different West Sussex folk dance groups. The display team gives everyone a chance to dress up and perform in a national costume, as well as the added enjoyment of visiting fetes in West Sussex and other venues further afield. 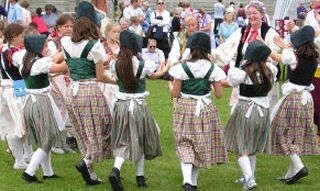 Recently our main event every year has been dancing around the town over the weekend of the Southdowns Folk Festival. They have given international dance displays and lectures to the W.I. The Chichester Rotary Club organised several Mayfests and BRIDE took part every year. They have danced at the Victoria Embankment Gardens Theatre, London, and the CCPR Show at the Royal Albert Hall. The children also have appeared at the Point Theatre in Eastleigh, and competed in the 2009 International Musical Eisteddfod in Llangollen, Wales. They have been featured in local papers often, on television several times (albeit mostly measured in tens of seconds), with their entire eight minute performance at Llangollen aired on Welsh television more than once. A recent cameo appearance (all of 6 seconds) occurred in episode 1 of John Sargeant's 'On the Tourism Trail'. The links on the left lead you to more information on costumes belonging to the group, borrowed or part of Janet's personal collection.